My colleague recommended a sushi bar near our meeting venue at lunchtime, so off I went into the GPO building seeking a light meal and some raw fish. Sosumi didn’t disappoint. 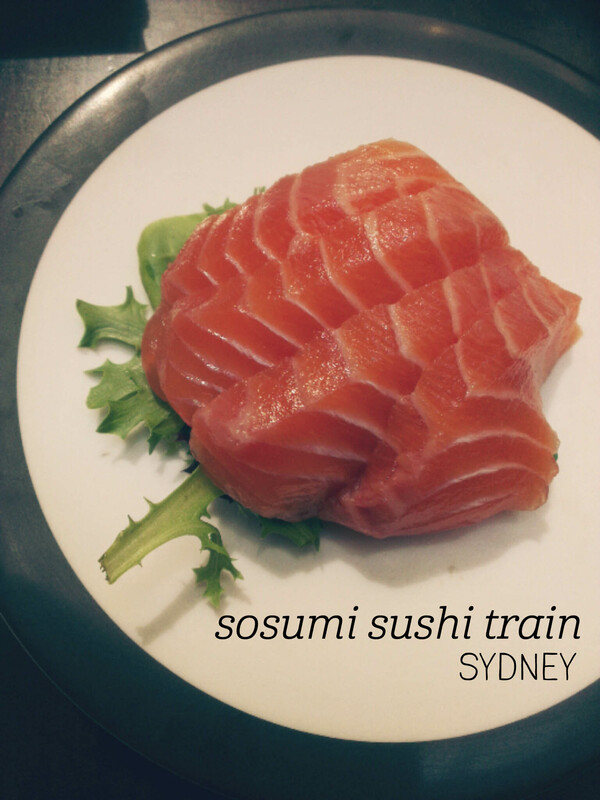 The staff were professional and attentive, and I launched right in with a plate of salmon sashimi. There were 4 slices on the plate with a small salad underneath for garnish, and each slice was plump, tender and very tasty. Yes the pieces were smaller than you would get in Japan, but by Australian standards, it was quite good. Next up was the seaweed salad, which was quite generous and had a flavour just like those I’ve had in Japan. I tried a plate with four mini raw tuna rolls, which were quite small but also very tasty, and I was then lucky enough to scoop up an aburi salmon plate (my absolute favourite) – the salmon was thin and there were only two pieces, but it satisfied my craving for sushi nicely. Be warned though, Sosumi offers quality, not value, so don’t expect to walk away full without a significant spend. After an amazing dinner on Pontocho-dori, we wandered across the river to Gion, Kyoto’s famous geisha quarter, also famed for its tea stores. I had a real craving for icecream, and was a bit sad to see so many stores closed for the night along Shijo-dori, the main street. 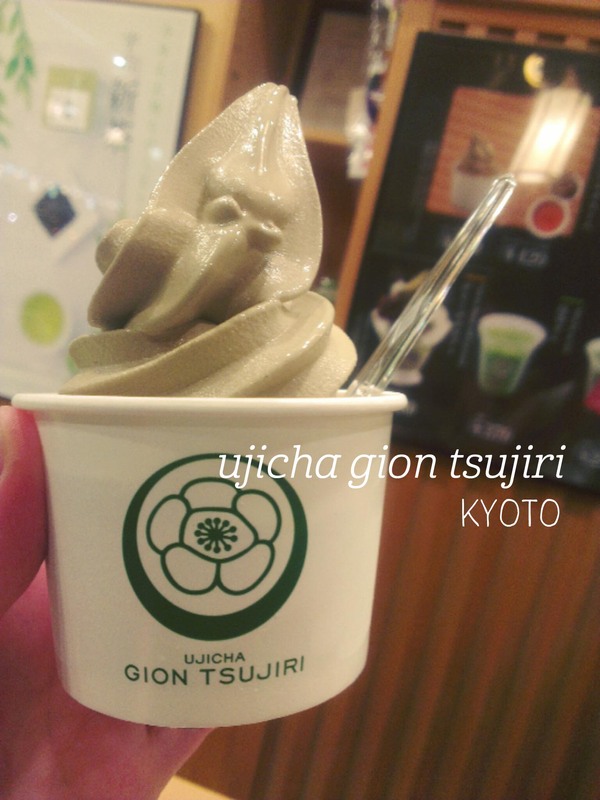 But when I spotted a couple of people walking along with soft serves in hand, we kept going and eventually found Ujicha Gion Tsujiri serving take aways. Yes! I hadn’t had many traditional-flavoured icecreams on this trip, so I picked the more exotic of the two options – hojicha, rather than the standard matcha. Hojicha is a green tea that’s been roasted over charcoal, giving it a more complex, smoky flavour. This was evident even from the colour, which was more a khaki than bright green. I absoutely loved it. The flavour had more bitterness than your standard icecream, but the roasted flavour really added a lot of depth and it tasted like what I imagine tea with cream would be like. The texture was rich and creamy, as soft serves should be, and I devoured the little cupful happily. Part one is here. The second main was agnolotti with mushrooms, truffle, pine nuts and a creamy bone marrow sauce, and this was my favourite of the two. I loved the rich cream sauce and the pairing of truffle with forest mushrooms. The pasta was clearly house-made and had a lovely bite. Looking at the dish, I just wanted to dive right in, with all that beautiful grated parmesan on top! By this point we were getting very full – I sipped at my mocktail (strawberry and mint lemonade – uttery divine and something I will go back for) and enjoyed the Autolyse bread with butter and salt, topped with a truffle crisp (the strongest truffle flavour of the day). 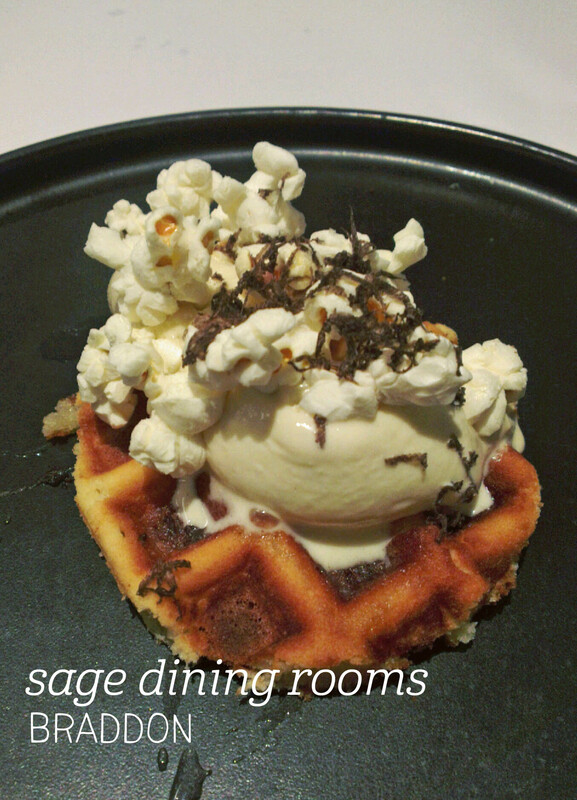 The first dessert was the sweet and it was at its best with a mouthful capturing all of the elements – the sweet waffle, the not-very-sweet icecream, the shaved truffle and the salty popcorn. Everything worked perfectly to create a complex, sophisticated dessert. Finally, we finished with truffled brie, served with thyme-infused leatherwood honey and a neutral, very thin crispbread. The thyme made the honey almost savoury – again, trying the dish with all the elements in one mouthful yielded the best flavour. Sage, you sure know how to make a first impression! The Sage truffle lunch is on until the end of July as part of the Canberra Truffle Festival. This was my first visit to Sage, and what better occasion than the Truffle Festival? 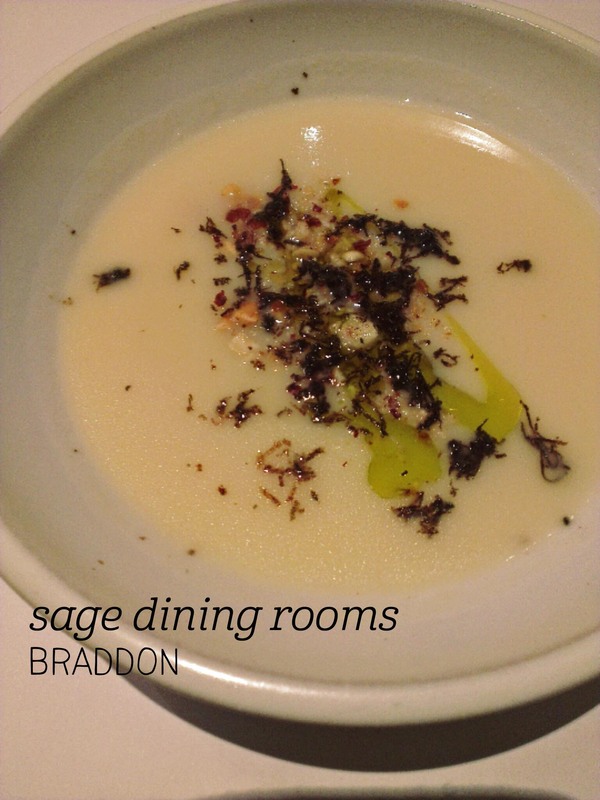 Sage is a fine dining restaurant and the service really reflected that – the staff were wonderfully attentive but not intrusive, and happily slowed down the pace of our courses when we lingered over each one. My friend and I tried all of the 6 dishes offered for the truffle lunch. We were delighted by the perfect amuse-bouche to start – a ‘salt and vinegar’ custard with truffle. It was the lightest custard I’ve ever tried and the salted, crispy top had me salavating! First course was a cauliflower veloute (French-style soup) with hazelnuts and truffle – I could have eaten this all day long. It was thick, rich and had the perfect balance of textures. Entree two was a 63 degree hen’s egg with polenta, with fun pops of chives and corn with the oozy egg yolk. The portions were really generous, as was the amount of truffle on each dish. Main number one was chicken breast with crisped pumpernickel and a divine sauce (where I suspect the truffle was hiding). The chicken was perfectly tender, although I think this dish was less strong at showcasing the truffle than the rest. Part two of this review to follow. 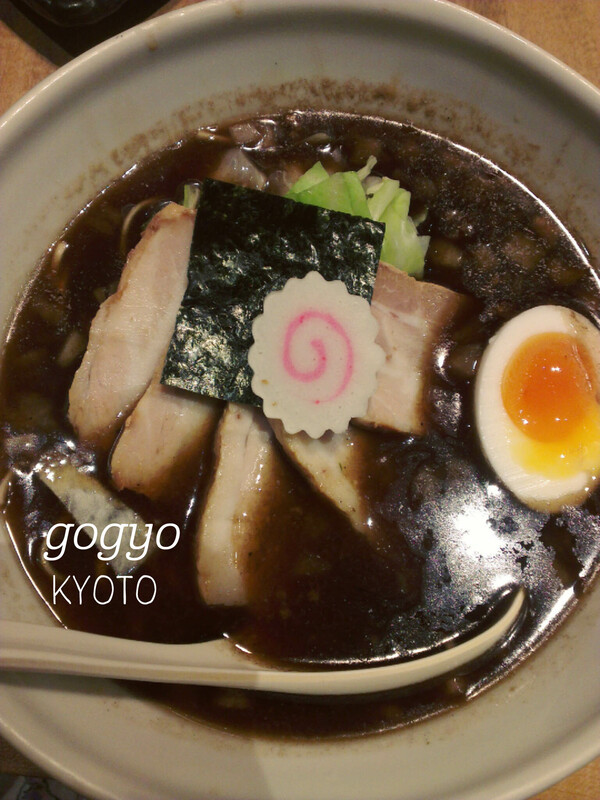 I remember my first meal at Gogyo very well – it was first time I really fell in love with ramen. Here wasn’t just an oily or fatty broth, here was broth with some serious flavour. Years later, it was just as good as I remembered. After exploring the Nishiki Market, we lined up to be the first in for dinner at Gogyo. The service is quite excellent – the staff are attentive to your every need and are really professional. Dining on a weekend, we received a starter for ¥300 and had a choice between ‘radish’ or ‘chicken’. I picked radish and enjoyed the warmed little dish with its mysterious sauce (whatever it was, was delicious). Next up was a plate of fresh cucumber with a spicy sesame seasoning – a nice contrast between the heat of the seasoning and the cool cucumber. Then the main game – the burnt soy ramen. Yep, bring on the black broth and its rich, salty flavour. The ramen themselves have plenty of bite and the pork was lovely and tender. I adore soft-boiled ramen eggs and this was one of the best. All the ingredients combined to make a really special ramen unlike any other I’ve ever eaten. Brewtown has been on my to visit list for a while, so with an afternoon to while away in Newtown, I made a beeline for their store. It occupies the former home of Berkelouw Books on O’Connell Street, and is well-known for their take on the cronut – the Brewnut. I was seated right away at a share table near the window, and ordered a soy hot chocolate and a fruit and nut Brewnut. While I waited, I admired the tasteful decor – from the white tiled tabletop, to the fresh flowers and old-fashioned Newtown fire department sign on the wall. My hot chocolate arrived first and was a real delight – Sydney’s inner suburbs really know how to steam soy. There was just the right amount of sweetness, given the sugar hit that was about to follow. 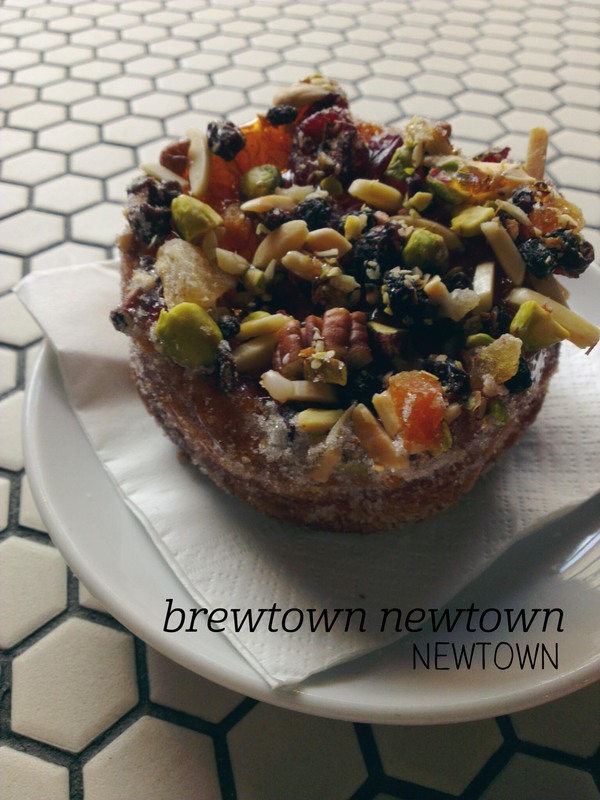 The Brewnut was a towering cavalcade of fruit and nuts – pistachios, almonds, pecans, crystalised ginger, raisins and dried apricots all vyed for space on the layers of luscious, deep-fried pastry. Yes, it was sugar overload, but oh man, these guys know how to bring the flavour. Without a doubt it was the most creative, well-executed cronut interpretation I’ve tried to date. Yum. I was super excited to try Patissez’s raspberry and pomegranate galettes after drooling over them on their Instagram feed, but alas, they had sold out when I arrived. The staff were really friendly and helpful, and when I asked for another fruity cake to try, the pointed me at this one – a raspberry and lychee dacquois. As you can see, it’s pretty, and yep, it tastes amazing. Let me walk you through it. The garnish on top is a fresh raspberry and a cluster of caramel popcorn -the popcorn doesn’t relate to any other flavours in the cake, but it’s really tasty! 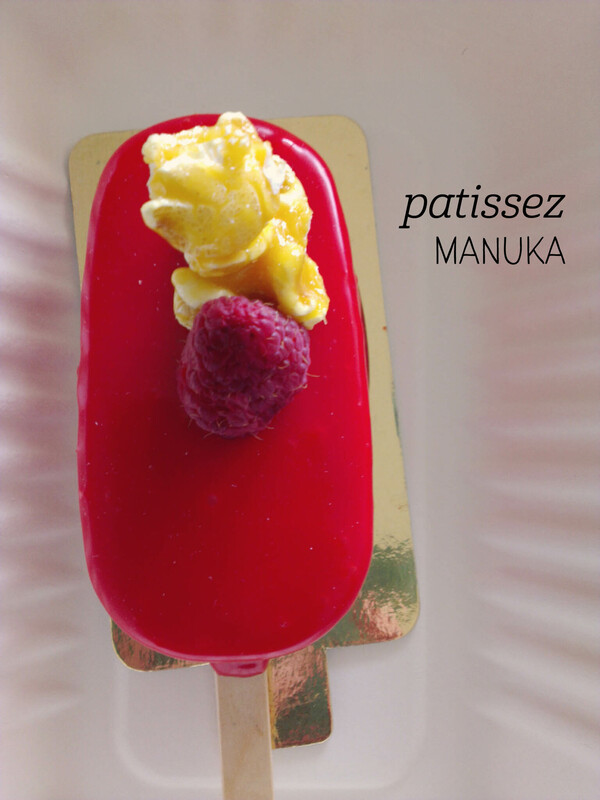 The red outer layer is a raspberry gel of some kind, and it’s really thick and stretchy – quite an unusual texture. The raspberry flavour is excellent though, and it matches the lychee cream filling perfectly. The lychee cream is really authentic and I couldn’t believe how light and fluffy it was – but hidden inside is a layer of more raspberry and pistachio cake – as if it could get any better! The flavours and textures all worked together really well and the dacquois was just the right size for an afternoon treat.